The Metropolitan Division is easily the stronger of two divisions in the Eastern Conference. Five Metropolitan Division teams made the playoffs last year, including the Capitals, Penguins, Rangers, Islanders and Flyers. Here is an overview of the offseasons of the eight teams that make up the Metropolitan Division: the Carolina Hurricanes, Columbus Blue Jackets, New Jersey Devils, New York Islanders, New York Rangers, Philadelphia Flyers, Pittsburgh Penguins and Washington Capitals. Not much was expected of the Carolina Hurricanes headed into last season. However, the team actually had a pretty strong year. The Canes remained in playoff contention for most of the year, often sitting in the eighth and ninth slot in the conference. At the end of February the team went on a 4-1-1 run and found themselves with an overall record of 28-23-10. Most ignored them as a real playoff threat but the team was in contention for most of the season. Unfortunately for Carolina, the team then lost three in a row and was outscored 12-3 in that span. The trade deadline came shortly thereafter, and general manager Ron Francis traded Eric Staal to the Rangers and Kris Versteeg to the Kings. There were some positive takeaways from the decent season, however. First, Victor Rask emerged as a true leader on this team. He set career highs across the board and was eventually rewarded with an offseason extension. Additionally, Jeff Skinner rediscovered his scoring ability and finished the year with 28 goals and 51 points, his best production in a few seasons. Several young players got their first taste of NHL hockey, including defenseman Noah Hanifin. Justin Faulk scored a career-high 16 goals but only played in 64 games due to injury. Elias Lindholm had a somewhat disappointing season, matching his 39 points from the year before. He will be expected to build on that performance this season. The goaltending was pretty iffy throughout the season, but the team found ways to win. The Hurricanes surprised many and will look to have another strong season this year with a lot of new talent injected into the lineup. The Hurricanes made a fantastic trade in acquiring Teuvo Teravainen from the Chicago Blackhawks. The Blackhawks were desperate to move Bryan Bickell’s $4 million cap hit off the books, and the Hurricanes managed to land Teravainen as part of the deal. Teravainen was one of the Blackhawks’ top prospects and often drew comparisons to Patrick Kane. First of all, since Bickell only has one year remaining on his contract, this is an absolute steal for Carolina. Chicago needed to move the contract in order to maintain a quality roster this season, but it really doesn’t inhibit Carolina moving forward at all. At worst, Carolina keeps the contract on the books and pays Bickell his $4.5 million salary. At best, perhaps Bickell takes well to the change in scenery. At the moment Bickell is out of the lineup as a healthy scratch but started the year skating on the team’s fourth line but first power-play unit. No matter what, though, this was a slam dunk for Carolina. The fact that the team can move forward with Teravainen is just icing on the cake. Teravainen, 22, had a strong year in his first full NHL campaign last season. He scored 13 goals and 35 points in 78 games and did so playing third-line minutes. Though he is currently on the team’s third line with Elias Lindholm and Sebastian Aho, Teravainen is expected to be a key part of the Hurricances’ offense moving forward. He is capable of being relied upon as a top-six winger and has a bright future in the NHL. Teravainen is a former first-round pick, selected 18th overall in the 2012 NHL Entry Draft. The Hurricanes signed underrated free-agent forward Lee Stempniak to a two-year, $5 million deal. Stempniak has found success everywhere he has been over the past few seasons, including Calgary, Pittsburgh, New York (Rangers), Winnipeg, New Jersey and Boston. He was especially effective as a member of the Devils for most of last season, scoring 16 goals and 41 points in 63 games. He had an excellent debut, scoring a power-play goal and an assist in the team’s first game of the year. Stempniak is skating on the team’s top line with Jeff Skinner and Victor Rask, and he is playing one of the points on the team’s top power-play unit. He has six points in eight games this season, and his linemates are two of the hottest players in the league. 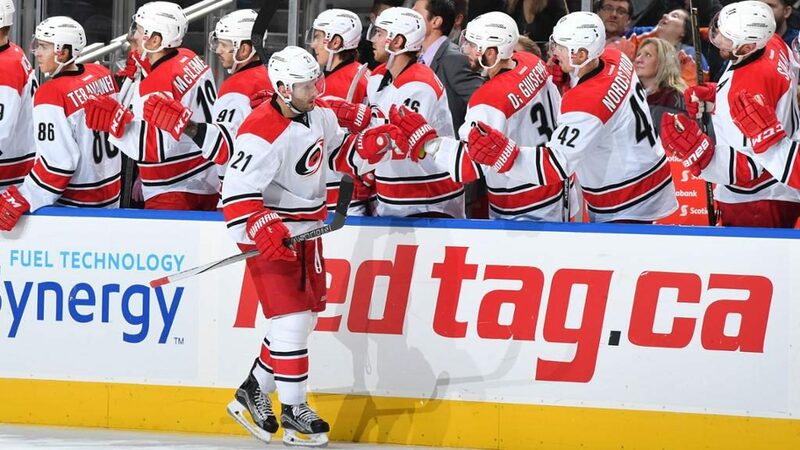 The Hurricanes also re-signed multiple players on the team, including goaltender Cam Ward and first-line center Victor Rask. The Rask extension was an especially effective signing, as the team signed him to a six-year, $24 million contract. The deal carries a $4 million cap hit. That’s a solid deal for a player who set career highs across the board last season, including goals (21), assists (27), points (48), power-play goals (5), power-play points (18), game-winning goals (5) and overtime goals (2). Though it was only his second season in the NHL, it’s obvious his play is trending in the right direction. In fact, his play has been even better this year. Rask has scored at least one point in every game and has ten points in eight games. Being able to re-sign an important part of the team at such a reasonable deal is a fantastic offseason move by management. The team also re-signed goaltender Cam Ward to a two-year, $6.6 million deal. Ward has been a member of the Hurricanes since the 2005-2006 season, a season that ended with the Hurricanes winning the Stanley Cup. Though he has struggled on and off over the past several seasons, the Hurricanes decided to give him another extension, the same length as goaltender Eddie Lack, who was acquired from Vancouver last season. The two will share crease duties this season, but Ward has carried the majority of the load so far. Having two goalies signed for a total of $6.05 million against the cap is quite reasonable. The Hurricanes outperformed what most expected of them last season. The team has gotten stronger in the offseason despite losing Eric Staal, who signed with the Minnesota Wild. The team will rely more heavily on young talent this year, which figures to be a good thing. Players like Victor Rask and Jeff Skinner are coming off strong seasons and have already gotten off to great starts this season, scoring a combined 21 points so far. The team’s forward corps is a lot deeper than it has been in a while. The top line of Skinner, Rask and Lee Stempniak looks to have a very successful season, and with players like Teuvo Teravainen, Bryan Bickell, Viktor Stalberg and Sebastian Aho on board, the team should be able to roll four effective lines. 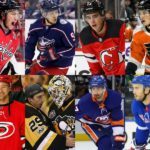 The fact that the Hurricanes are now in the Metropoiltan Division will work against them, as teams like the Capitals, Penguins and Rangers, among others, will be very competitive. However, there is a lot to like about the 2016-2017 Carolina roster, and anything is possible. The Columbus Blue Jackets’ season was almost over before it started. The team lost the first eight games of the year, getting outscored 37-15 in that stretch. The horrific start resulted in the firing of head coach Todd Richardson and the hiring of coach John Tortorella. The team was never able to recover. Perhaps the biggest surprise of the season was the trade of first-line center Ryan Johansen to Nashville for defenseman Seth Jones. Johansen didn’t take well to Tortorella’s new system; in fact, he was a healthy scratch on several occasions before the trade was executed. Jones had a pretty good season for Columbus, putting up 20 points (nine of which came on the man-advantage) in 41 games, but it’s difficult to lose a first-line center. Luckily for Columbus, Boone Jenner had a fantastic season last year and emerged as a top power-forward in the game, scoring 30 goals and 49 points. Unfortunately, Jenner has gotten off to a miserable start this year and has been shuffled throughout the lineup; he has one assist in seven games and is a combined minus-six. Along with Jenner, Brandon Saad had a very strong year, scoring 31 goals in his first season with Columbus. Saad was traded by the Blackhawks last offseason and signed a six-year, $36 million extension with Columbus. He set career highs in goals and points (53) and finished the year with seven game-winning goals. Scott Hartnell also had a decent season, chipping in 23 goals and 49 points. Cam Atkinson had a career year, scoring 27 goals and 53 points, tied with Saad for the team lead. Atkinson set career highs in goals, assists (26) and points. Nick Foligno, named the captain of the Blue Jackets after an incredible 2014-2015 season that saw him scored 31 goals and 73 points in 79 games, had a miserable year last year. He scored only 12 goals and 37 points, essentially half as many as the year before. He will need to have a much better campaign this year. So far so good from Foligno, as he has one goal and eight points in seven games. Goaltender Sergei Bobrovsky experienced another season ripe with injuries, appearing in only 37 games for the Jackets and going 15-19-1 in those starts. The Blue Jackets had a relatively quiet offseason despite such a sub-par 2015-2016 campaign. The biggest move of the offseason was the extension awarded to Seth Jones. Jones signed a six-year, $32.4 million extension, a deal that carries a $5.4 million cap hit. Considering where Jones is in his career and the type of defenseman he is projected to be, this was an excellent deal for Columbus. There were concerns about a potential offer sheet for Jones, so the fact that Jackets general manager Jarmo Kekalainen took care of the deal before the start of free agency was key. Jones has 17 goals and 83 points in 240 career regular-season games with Nashville and Columbus, as well as four assists in six career playoff games with the Predators. Jones could have a very strong year in his first full season with the Jackets. In fact, he has already gotten off to a strong start to the 2016-2017 campaign with two points in his first game; he has three points in seven games. The Jones deal brought Columbus to within $50,000 of the upper cap limit. However, the Blue Jackets bought out the contracts of defenseman Fedor Tyutin and forward Jared Boll, which gave the team around $4.4 million in cap room. The only other relevant offseason move made by Columbus was the free-agent signing of Sam Gagner, who spent last season with the Philadelphia Flyers. Gagner has a lot of talent but has been shuffled from team to team over the past few seasons. He could be a big part of Columbus’ offense this season, especially if he has the chance to play with some of Columbus’ more talented forwards. Gagner signed a one-year deal for $650,000, which was an extremely low-risk move for Columbus. The Blue Jackets are coming off a depressing season that saw the team finish with a record of 34-40-8, good enough for last place in the Metropolitan Division. The 76-point campaign turned out to be the fourth-worst record in the entire league. The team has most of the same players returning this season and is banking on getting off to a better start. The Jackets currently sit at 3-3-1, and the roster has enough talent to be much more competitive this season. With players like Boone Jenner, Cam Atkinson and Brandon Saad, along with veterans Brandon Dubinsky and Scott Hartnell, this offense has more than enough firepower to win a lot of games this season, especially if Nick Foligno can step up and have a much better year. The expectations for Columbus are nowhere near what they were last year, where everyone in the hockey world figured Columbus was a lock for the playoffs after finishing the previous year on an 18-1-1 run. However, though the Metropolitan Division is extremely competitive, the Blue Jackets have a lot of the right pieces in place and could give other teams a run for their money. The Devils finished just above .500 last year, missing the playoffs for the fourth consecutive season. New Jersey was still within playoff contention by mid-February. The team won three in a row including a Valentine’s Day 1-0 win against the Kings. At that point, the Devils were 29-21-7. But the team was unable to hold on, failing to win two in a row more than once for the rest of the year. The Devils finished the season 9-13-1, finishing seventh in the Metropolitan Division and 12th in the Eastern Conference. Despite an average season by most of the team, the Devils had the chance to make playoffs due to the tremendous play of goaltender Cory Schneider, who could be the most underrated goalie in the league. Schneider finished the year 27-25-6 with a 2.15 goals-against average, a .924 save percentage and four shutouts. He was in the discussion for the Vezina Trophy as goalie of the year. Incredibly, the Devils had a chance to win most nights despite posting a league-worst goals-per-game average of 2.22. But Schneider’s effort wasn’t enough without an ability for the Devils to put goals on the board. That is something the Devils clearly needed to address this offseason. The Devils made out like bandits in the trade that sent Adam Larsson to Edmonton in exchange for Taylor Hall. Though Larsson is very talented and has a bright future in the NHL, Hall is an elite offensive player and is the best forward the Devils have had since Ilya Kovalchuk and Zach Parise. Hall and the Devils’ offense have gotten off to a slow start this year, scoring an average of 2.25 goals per game so far. However, the offense has improved in recent games and starting to pick up. In any case, the Devils took major strides in addressing the issue of offensive production by bringing Hall into the fold. Devils general manager Ray Shero pulled off a steal of a deal. No matter how good Larsson turns out to be, Shero orchestrated a one-sided move in his favor. Hall, who will turn 25 November 14, led the Oilers in goals (26) and points (65) last season. He has twice hit the 27-goal mark and has scored 50+ points in four out of six seasons, scoring a career-high 80 points in 2013-2014. He was on pace for 88 points in 79 games during the lockout-shortened season in which he scored 50 points in 45 games. He has 328 points in 381 career regular-season games. He has five goals and seven points through eight games. Most people expected the Oilers to move someone like Ryan Nugent-Hopkins for a top-four defenseman. But clearly the Devils have depth up the middle with Adam Henrique, Travis Zajac and Pavel Zacha. But Hall was and is more valuable than Larsson and more valuable to his team than other offensive players Shero could have acquired from the Oilers’ roster. Larsson, who will turn 24 November 12, has a lot of potential. He has nine goals and 71 points in 283 career regular-season games, which includes two assists in nine games with the Oilers this season. But those numbers don’t accurately reflect Larsson’s game as a strong two-way defender. He has looked very comfortable and is a stabling force on the Oilers’ blueline. The Devils brought in free-agent defensemen Yohann Auvitu, Ben Lovejoy and Kyle Quincey in the offseason, and also re-signed John Merill. Those four guys, along with Andy Greene and Damon Severson, make up New Jersey’s defense corps. It wasn’t looking pretty for the Devils’ defense immediately following the Edmonton trade, but Shero did a solid job filling in the top-six. With Cory Schneider in net, the Devils’ back end came together nicely heading into the season. That being said, the Devils totally missed the ball by letting David Schlemko sign in San Jose. Schlemko had an excellent season with the Devils and would not have cost much to retain. Schlemko signed a four-year deal with an average annual value of $2.1 million with San Jose. That should have been at the top of the Devils’ offseason to-do list. The Devils re-signed forward Kyle Palmieri to a significant five-year, $23.25 million extension. The Devils gave up legitimate assets (a second- and third-round pick) last summer to acquire Palmieri, and the risk paid off in spades. Palmieri never had a long-term, prominent role with the Ducks but shouldered the increased responsibility admirably last season in New Jersey. Palmieri had scored 14 goals two years in a row prior to the trade, with his career point total being just 31 points. But his numbers nearly doubled with the Devils, as he scored 30 goals and 57 points in 82 games. He was one of 28 NHL players to reach the 30-goal mark last season. He has two goals and four points through eight games this season. The Devils can continue to expect strong numbers from Palmieri, and he will be a key top-six forward for New Jersey for years to come. Aside from a few small, smart transactions (outlined below), the other move the Devils made involved the waiver wire. The New York Islanders signed forward P.A. Parenteau to a one-year, $1.25 million contract to fulfill his second stint with the Isles. Parenteau was believed to be due to start out on John Tavares’ wing on the Islanders’ top line, but he was waived right before the start of the regular season. Shero jumped on the opportunity and added yet an other strong forward to his team. Claiming Parenteau was an easy move for the Devils, but it could prove to be one of the most underrated moves of the year. Parenteau has bounced around over the past few years but has been effective at every stop. He scored a career-high 67 points in the 2011-2012 season with the Islanders but signed with Colorado the following offseason. He scored 43 points in 48 games and 33 points in 55 games in his two seasons with the Avalanche, respectively. He was traded to Montreal and had a down year as a member of the Habs, but he had another strong season in Toronto last year, scoring 20 goals and 41 points. Parenteau is off to a decent start with the Devils, with three goals and an assist in eight games. He is a top-six winger for New Jersey and sees time on the team’s second power-play unit. He can easily slide up and down the lineup and could prove to be a key asset to the Devils’ success this season. The Devils have not made the playoffs since the team took a run at the Stanley Cup in 2012, losing in six games to the Los Angeles Kings. Since that time, the Devils have gotten a new coach, a new general manager and almost an entirely new roster. In fact, only a few members of that 2012 team remain (i.e., Adam Henrique, Travis Zajac, Andy Greene, etc.). It seems as though the team has finally recovered from the losses of Zach Parise and Ilya Kovalchuk, as the forward corps on this year’s team is the best it has been in years. 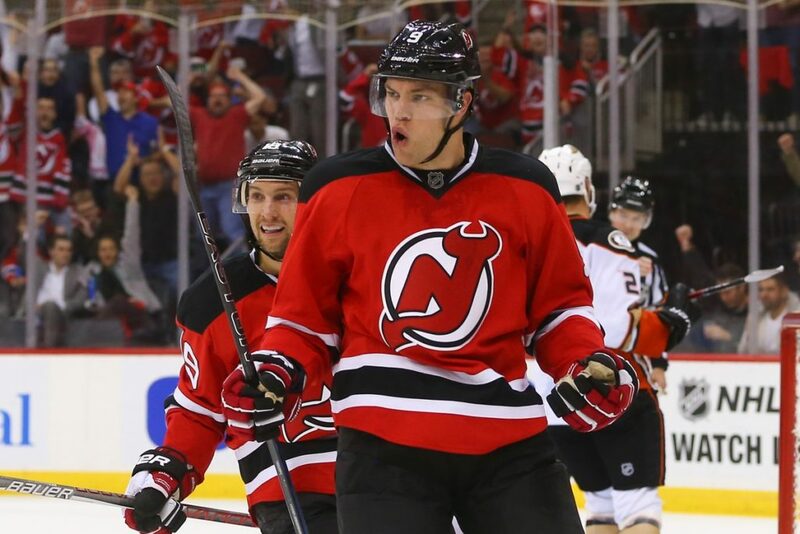 The acquisition of Taylor Hall is the envy of the entire National Hockey League. Hall already has five goals on the season, but he hasn’t even touched the surface of what he can bring to this club. With the acquisition of players like Beau Bennett, Devante Smith-Pelly (acquired last year), P.A. Parenteau and Vernon Fiddler, the Devils could roll four lines for the first time in years. If there is one thing the team needed to improve, it was goal support for Cory Schneider. The Devils have put together a strong offense and filled in some of the holes defensively. The team has gotten off to a relatively slow start this season in terms of production, as the lines haven’t looked as dangerous as many would have expected. That being said, the Devils hold a 4-2-2 record after eight games, so anything could happen. It seems like a stretch for the team to make the playoffs in the tough Metropolitan Division. However, if the offense can produce on a consistent basis, the Devils have the goaltending to make it happen. The New York Islanders may have had one of the worst offseasons in the National Hockey League, especially in the Metropolitan Division. After a very strong season last year that saw the Islanders win the team’s first playoff series in nearly 25 years, it’s unclear exactly what was going through the minds of Islanders general manager Garth Snow and the rest of Islanders management. The team lost two key cogs in the offensive wheel, instead electing to sign two forwards on day one of free agency, only one of which could resemble a replacement. The team also re-signed a player who has historically played on the fourth line to a substantial five-year deal with a $3.35 million cap hit. Though there are a lot of positives to take away from last season, such as the outstanding goalie tandem of Jaroslav Halak and Thomas Greiss, the development of Brock Nelson and other things, many of last year’s positives are irrelevant for this season thanks to offseason decisions. For example, Kyle Okposo’s strong 64-point season: irrelevant. Frans Nielsen’s 52-point season and continued genius two-way play: irrelevant. The best fourth line in the league: partially irrelevant. After taking several steps forward last year, it could be argued the Islanders have taken several steps backwards this season. Here’s why. 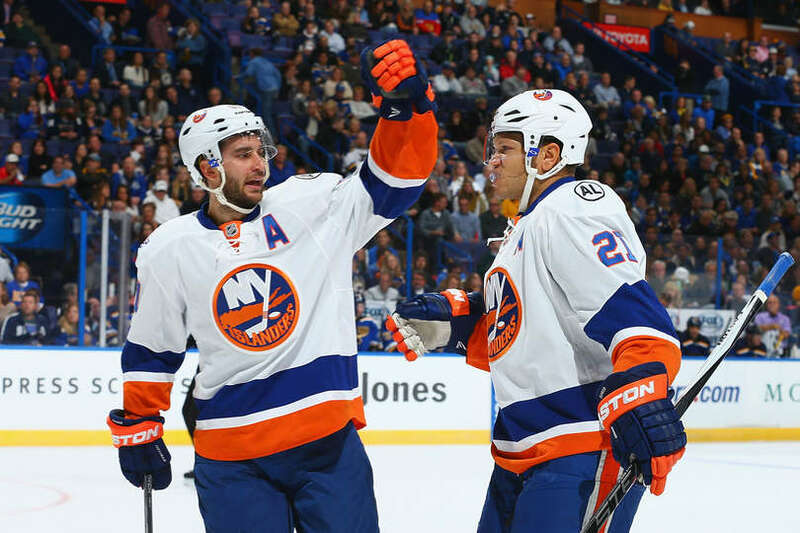 The Islanders let free-agent forwards Kyle Okposo and Frans Nielsen walk. Okposo signed a seven-year, $42 million deal with the Buffalo Sabres, a deal that carries an average annual value of $6 million. Considering Okposo’s career numbers, this is a strong deal. Certainly, it’s a deal the Islanders could have afforded. Though the term may seem long, Okposo is just 28 years old so it’s more than reasonable. Okposo was one of the most talented free-agent forwards in free agency, but it makes little sense why the Isles didn’t re-sign him. He might have taken a slight hometown discount, so he could have signed long-term for $5.5 million or so. That would have been a great deal and a greatdoes have experience, including multiple Stanley Cup victories, he’s not necessarily a better player. That being said, Okposo was a solid leader for the club. He was a consistent scorer for the Islanders, scoring 69, 51 and 64 points in his final three seasons with New York, respectively. Plus, there’s no way the Islanders could have known if Ladd would gel with Tavares. Okposo was a solid player and a great fit with Tavares, which is another reason why the move is so strange. Yes, the Islanders and Tavares were able to survive losing Matt Moulson a few years ago (who ironically went to Buffalo too), but Okposo had much more talent and would be harder to replace. Okposo has four goals and seven points in seven games so far this season with Buffalo; Ladd has a single assist through nine games and has not yet found twine. Perhaps more significantly, the Islanders lost Frans Nielsen in the offseason. Nielsen is one of the most underrated players in the entire National Hockey League. He does everything throughout the game: he’s talented offensively, plays a strong transition game, is an excellent faceoff guy, plays solid defense and even has one of the best shootout percentages in the league. Nielsen has been the team’s second-line center, and he’s been with the Isles for his entire career. Losing someone of Nielsen’s caliber is difficult to come back from. While losing Nielsen will definitely hurt the Islanders, it’s at least more understandable why Garth Snow let him walk compared to Okposo. For one thing, Nielsen is 32 years old. That’s not considered old in the NHL, but when you consider a long-term deal, things can get complicated. Nielsen ended up signing a six-year, $30 million contract with Detroit. While six years is a lot, especially for a 32-year-old player, it’s still a very reasonable deal and one the Islanders could certainly have afforded. Five million dollars for an excellent second-line center who takes the difficult minutes, kills penalties, plays on the power-play and does everything a coach could possibly want and a team could possibly need is not too much. The Islanders are coming off the best season in almost a quarter of a century. The organization owed it to the players and to the fans to build on last season, but instead the team is worse. Nielsen is currently centering Detroit’s top line and has six points in ten games. To make matters worse, the Islanders did not bring in any new personnel to try to replace Nielsen. Part of that is because Nielsen is not really a replaceable player. But more than that, the team obviously felt Brock Nelson was ready to step in and step up as the second-line center. He has had a strong season so far and has played well, but that doesn’t mean the team wouldn’t have been much better off with Nielsen in the lineup. The other main player the Islanders signed in the offseason was Jason Chimera, who signed a two-year, $5.5 million deal. Chimera had been a member of the Washington Capitals since the middle of the 2009-2010 season, and put up decent numbers in parts of seven seasons with the Capitals. Ironically, his best season came in his final year with Washington in which he scored 20 goals and 40 points in 82 games. The most useful asset Chimera brings to the table is his deceptive speed. He is one of the faster veteran forwards in the league, and it helps him play the cycle and keep plays alive. It’s unlikely he’ll reach the 20-goal mark this year, though it’s still unclear what role he will play on the Isles. Chimera is a very strong bottom-six forward and could be a decent second-line forward if the rest of the line had strong chemistry. But Chimera doesn’t really fill a need. He adds speed and some size but he doesn’t address the holes left behind this offseason. The team also let Matt Martin walk. This decision was more than understandable given the money he was seeking. Though Martin was a key part of the Islanders’ fourth line, believed by many to be the best fourth line in the NHL, the Islanders have plenty of depth and did not need to overpay Martin to play fourth-line duties. This is true especially since the other two-thirds of the fourth line remain with the team. Cal Clutterbuck in particular can continue to play a strong, tough game in Martin’s absence. Perhaps the strangest move of the offseason, however, was signing P.A. Parenteau to a reasonable one-year, $1.25 million deal and then waiving him right before the start of the season. It’s still a bizarre situation, especially since Parenteau and John Tavares played a lot of good hockey together. Clearly the Islanders chose younger players in the organization over Parenteau, but it’s not something we see often in the NHL. Perhaps more confusing is the contract awarded to fourth-liner Casey Cizikas. Fourth-line players don’t normally earn five-year deals with average annual values of $3.35 million. Cizikas has never scored more than 30 points, and while he is an important role player for the team, that’s a LOT of money in a salary cap world. One intelligent move the Islanders made, however, was picking up Dennis Seidenberg, who was bought out by the Boston Bruins. Seidenberg is a strong defensive defenseman who blocks shots and has a lot of experience. He makes the team’s depth at defense a lot more substantial. At the end of the day, the Islanders’ roster is weaker than it was one year ago. Andrew Ladd, like Kyle Okposo, plays a physical, two-way game and can generate a lot of offense. Though he hasn’t shown it so far this year, we are only 9-10 games into the season. Most players find good chemistry with captain John Tavares, who is one of the best players in the world. Ladd is more than capable of scoring 60-70 points, but it’s still strange that the team let Okposo walk given the similarities between both players’ contracts. Jason Chimera is a good top-six forward with underestimated speed, but in no way can he replace Okposo or Nielsen. There is no real replacement for Nielsen. Brock Nelson is serving as the second-line center, and he is a legitimate player. However, Nielsen is one of the most underrated players in the NHL, and the Islanders, without a doubt, will miss him during the season and especially in the postseason. The Parenteau move is very suspicious, especially since he is now playing a top-six role for a division rival. The Islanders’ top six hasn’t had a great start to the season, though once again, it is still early. To be fair, the Islanders do have a lot of depth and should be able to tweak things enough to get back on track after going 4-5 through nine games. But it remains to be seen what exactly management was thinking in the offseason getting rid of proven pieces in favor of the unknown. The Rangers had a very disappointing early exit from the playoffs last year, losing to Pittsburgh in five games in the first round of the postseason. The team is built for a deep playoff run, but the Rangers were no match for Pittsburgh’s speed and system. 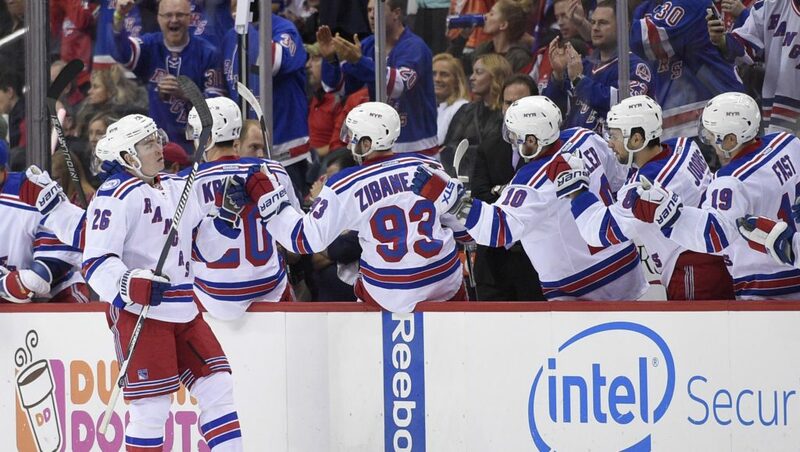 The Rangers played well during the year, with Mats Zuccarello, Derick Brassard and J.T. Miller having the strongest all-around seasons. One thing that was uncharacteristic last year was goaltender Henrik Lundqvist’s inability to be superhuman night in and night out. Lundqvist has always bailed the Rangers out time and time again, but the defense played so poorly last year that Lundqvist and the team gave up 215 goals compared to 187 in the 2014-2015 season and 190 in the 2013-2014 season. The team’s penalty kill was especially weak, which didn’t help matters. After finishing with the third-best penalty-kill (85.3%) in the 2013-2014 season and the sixth-best (84.3%) in the 2014-2015 season, the Rangers finished last season with a 78.2 percent penalty kill, good for fifth worst in the league. One of the most noticeable side effects of the team’s inconsistent play was the fact that the Rangers often allowed multiple goals in quick succession. This frequently took the Rangers out of the game and drained any momentum that may have been built up previously. Headed into the offseason, the Rangers had a few key free agents to re-sign but didn’t have too many options to improve the roster because of cap constraints. Interestingly, the Rangers managed to have an especially effective offseason in the end, even though things didn’t come together until late in the offseason. Here’s why. For most of the offseason, the hot topic most widely debated was where Jimmy Vesey would end up. 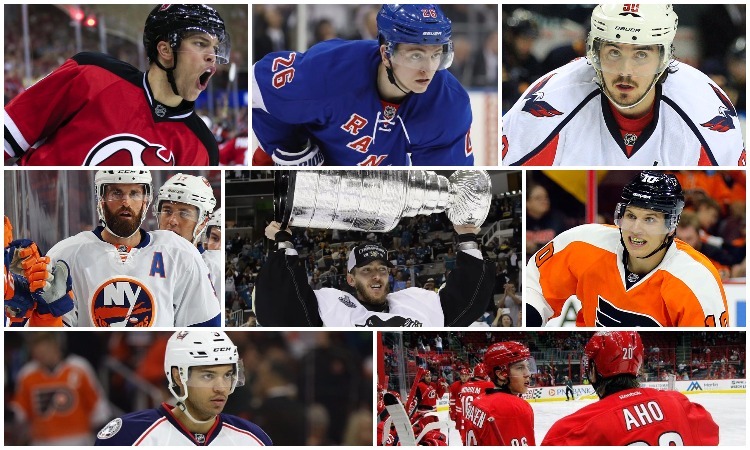 The free-agent forward had his selection of teams to sign with in mid-August. Thanks to persuasion by friend and Rangers forward Kevin Hayes, Vesey chose the Rangers and signed an entry-level contract. Vesey started the season on the Rangers’ top line with Derek Stepan and Mats Zuccarello and is still on the top line, though Rick Nash has recently moved up in Zuccarello’s position. Vesey scored his first goal in the Rangers’ third game and has five goals and six points in nine games this season. Landing Vesey was quite a feat for the Blueshirts, and it single-handedly changed the makeup of the team. Vesey scored 24 goals and 46 points in 33 games last year as a senior at Harvard University. He was the recipient of the 2016 Hobey Baker Award as the top player in collegiate hockey. Vesey was also a finalist for the award at the conclusion of the 2014-2015 season but ultimately finished as a runner-up behind Jack Eichel, who took home the honor. Vesey was originally drafted by the Nashville Predators in the third round (66) of the 2012 NHL Entry Draft but declined a contract offer after finishing his four-year career at Harvard. His rights were traded to Buffalo but Vesey decided to test free agency instead of signing with the Sabres. 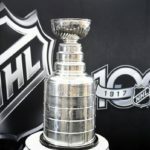 He then met with seven additional teams, including Toronto, Boston, Chicago, Pittsburgh, New Jersey and both New York teams (Islanders, Rangers). Players from those teams, such as Patrick Kane, Sidney Crosby, John Tavares and Kevin Hayes, met with or spoke to Vesey personally as part of their respective team’s pitch. Hayes spoke with Vesey many times over the course of the summer, as the two worked out together. In the end, Hayes and the Rangers came away victorious. This is the second time in two years that the Rangers have been able to land a highly-coveted free-agent collegiate player (ironically, Kevin Hayes signed with the team in the summer of 2014). This was a huge move for the Rangers, and it played a major role in what ended up being an impressive offseason. But before Vesey Watch came to a close, the Rangers made a surprising trade, sending Derick Brassard and a 7th-round pick to the Senators for Mika Zibanejad and a 2nd-round pick. The Rangers entered the offseason knowing that adding speed and youth to the lineup was a priority for the club moving forward. This past postseason featured a disappointing first-round exit for the Rangers, and the roster had grown stale. Acquiring Zibanejad was the first step in shaking things up and bringing younger skill to the roster. Zibanejad fits the bill as a speedy, skilled 23-year-old center who can also play wing. The Swedish forward set career highs in games played (81), goals (21), assists (30) and points (51) last season. Before the trade, Zibanejad had 64 goals and 151 points in 281 career regular-season games, as well as two goals and eight points in 16 career playoff games, all with Ottawa. He is also five years younger than Brassard. Though the Rangers could not have known this would be the case, Zibanejad has already fit in extremely well and has developed fantastic chemistry with Chris Kreider, who started the year with seven points in the team’s first five games. Zibanejad is tied for second on the team in points with eight points in nine games (Ryan McDonagh has eight assists). However, the Rangers lost one of the team’s most consistent, reliable players in Brassard, who led the team in playoff scoring in both of the past two seasons. Zibanejad has played well so far this year, but this is still October. It remains to be seen how much this will affect the team come April. In addition, the Rangers signed underrated forward Brandon Pirri to a one-year, $1.1 million deal. Pirri has started the year on the fourth line but has been an essential part of the Rangers’ power-play, which is generally inefficient. He has four goals, two of which came on the power-play, and six points in nine games so far this season. The team also brought in former Flame Josh Jooris, who signed a one-year, $600,000 deal. Jooris only has one goal on the year but offers the Rangers more depth up the middle. In fact, this Rangers roster has substantial depth, something the team has not had in a while. Pavel Buchnevich, whom the Rangers drafted in the 2013 NHL Entry Draft, has played very well this season despite missing a few games with an injury. Buchnevich was the third member of the Zibanejad and Kreider line before he and Kreider got hurt. The trio had great success in the preseason and was therefore kept together for the start of the regular season. The line could not have gotten off to a better start. However, Zuccarello is slated to play with Zibanejad and Kreider (at least for tonight), with Buchnevich moving down to the fourth line. But the team would not have the Zibanejad line or nearly as much depth without Chris Kreider, who signed a four-year, $18.5 million extension over the summer. This is incredible value for Kreider, who has not yet shown his full potential but has become one of the top power forwards in the game. If his play at the start of this season is any indication, Kreider is set for an explosive year, making this a complete steal for the Rangers. The team also re-signed J.T. Miller and Kevin Hayes to two-year bridge deals. Miller’s annual average value is $2.75 million, and Hayes’ is $2.6 million. The Miller signing is a complete bargain for the team on a temporary basis, especially since Miller was one of the best players on the team for all of last season. Since the team is trying to win now while also preserving its young talent, it makes sense why Miller was only signed for two years. The same is true of Hayes, though Hayes has not shown a fraction of the progress and ability Miller has displayed. The two contracts are important, however, as both players will be looked upon to contribute on a more consistent basis this year. So far, Miller leads the team in points with nine (three goals, six assists) and Hayes has six points (two goals, four assists) through nine games. The team was forced to trade the rights of Keith Yandle for salary cap reasons. Yandle brought a lot of offensive ability, especially on the power-play, but the Rangers weren’t ready to give him the money and term he wanted. He ended up signing a seven-year, $44.45 million contract, which carries a $6.35 million cap hit, with the Panthers. There’s no way the Rangers would have entertained that, and there’s no way the team could have afforded it. The team’s signing of winger Michael Grabner is a very underrated move. Grabner brings speed and experience to the team, and he is an exceptional penalty killer. He is always a threat short-handed, and he has enough skill where he can move up and down the lineup if need be. He scored a hat trick in New York’s 6-1 win over Tampa Bay on Sunday. Acquiring veteran defenseman Nick Holden from the Colorado Avalanche was another underrated move by the Rangers. Holden is a steady two-way defenseman who can play 20 minutes. He is more reliable than options the Rangers have had in the past, and he has played very well as Ryan McDonagh’s defense partner so far this season. To send a fourth-round pick to acquire a defenseman who ends up on the top pairing is quite a move. The Rangers ended up having quite a successful offseason. Signing Jimmy Vesey, trading Derick Brassard and bringing in eight new players to the starting lineup (Zibanejad, Buchnevich, Holden, Adam Clendening, Grabner, Jooris, Vesey and Pirri) is a lot of change in one offseason. The team was unable to buy out or move one of the expensive contracts on defense, such as Dan Girardi or Marc Staal, as was rumored. The same can be said of Rick Nash, though that was a less prevalent rumor over the summer. That being said, Jeff Gorton did a tremendous job. The team has more depth than it has had in years. Instead of bringing in Tanner Glass in the case of an injury, the team can turn to Jooris, Oscar Lindberg, Grabner, etc. On defense, the team has Clendening and Dylan McIlrath. These names don’t jump out at you, but Alain Vigneault has plenty of options to work with throughout the season. Though trading Brassard could prove to be more costly than expected come playoff time, the Rangers made a series of moves to redefine and reinvent the roster. This team is younger, faster and more skilled, and Gorton was able to do that without much cap space at all. The Flyers entered the 2015-2016 season in the midst of a mini rebuild. 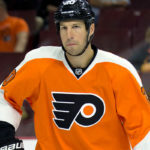 Most expected the team to miss the playoffs, and general manager Ron Hextall was content allowing the team’s talented prospect pool to develop while players like Vincent Lecavalier and R.J. Umberger ran out their contracts and occupied roster spots. The team iced virtually the same lineup as the year before, with Sam Gagner and Michal Neuvirth joining the fold. The main addition to the team was rookie head coach Dave Hakstol. But one of the biggest stories of the year was the emergence of rookie defenseman Shayne Gostisbehere, who was called up to the big club in mid-November when Mark Streit went down with an injury. Hextall had been reluctant to rush any of the Flyers’ esteemed prospects, but Ghost was in the right place at the right time, and boy did he deliver. He scored 17 goals and 46 points in 64 games, helping the Flyers turn the season around in memorable fashion. He had a 15-game point streak, setting an NHL record for a rookie defenseman and maintaining the longest point streak by a defenseman in two decades. Ghost scored five game-winning goals, including several in overtime. He was as clutch as can be, and it could be argued that the excitement and confidence he brought to the lineup is what truly saved the season for the Flyers. His performance earned him a Calder Trophy nomination as rookie of the year. The Flyers couldn’t have made the playoffs without an epic late-season push, which included a 15-5-3 run inspired by the failing health of Flyers owner and founder, Ed Snider, who passed away in early April just after the Flyers clinched a playoff berth. Though the team lost in six games in the first round to the Washington Capitals, there were plenty of positives to take away from last season. For one thing, Gostisbehere became a star defenseman. Captain Claude Giroux had another strong season despite a slow start, finishing the year with 22 goals and 67 points to lead the team in scoring. Wayne Simmonds finally hit the 30-goal mark and ended the regular season with 32 goals and 60 points. Michael Del Zotto established himself as the team’s best defenseman, though he missed 30 games and the entire postseason. Brayden Schenn also had a breakout year, which picked up full steam after his brother and Lecavalier were traded to Los Angeles in January. The biggest disappointment of the year was Jake Voracek’s performance, especially after signing a massive eight-year, $66 million extension. After scoring 22 goals and 81 points the year before, Voracek fell flat with 11 goals and 55 points. More than the point totals, Voracek was not the same player on the ice. He has looked much better at the beginning of this season, though. At the end of the day, it was a strong season for Hakstol and the Flyers. 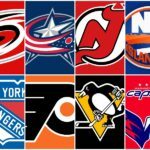 The team has since gotten rid of several troublesome contracts and players and has a real shot at making the playoffs despite the tight race in the Metropolitan Division. The biggest question ahead of the Flyers is what to do about the starting goalie. Both Steve Mason and Michal Neuvirth had incredible stretches last season, and the duo gave the Flyers some of the best goaltending the team has seen in many, many years. That being said, both are due for new contracts at the end of this season, so it will be interesting to see how that unfolds. Neuvirth was stellar in the playoffs but Mason has been the stronger of the two so far this year, though neither has been particularly impressive. The two will continue to share the crease this season. The Flyers had several free agents that needed to be re-signed, and agreements were reached with each one. The most significant was Brayden Schenn, who signed a four-year extension with an average annual value of $5.125 million. Both sides were able to avoid arbitration as the deal was signed at the eleventh hour. The extra term at this price point is not only beneficial to the Flyers and to Schenn moving forward, but it also makes him a more valuable trading chip if the Flyers decide to go down that road in the future. Schenn’s previous contract was a two-year, $5 million bridge deal, so the added security on the new contract will allow him to settle in and solidify his role as a key piece of the Flyers’ offense. It also allows management to further evaluate his future with the team, as he has not yet shown that he can be a consistent offensive force. That being said, Schenn is coming off a stellar season (his best in the NHL) in which he set career highs in goals (26), assists (33), points (59), power-play goals (11) and power-play points (22). He led the team in scoring after January 1 by scoring 44 points in 44 games. He has **84 goals and 193 points in 354 career regular-season games** with the Flyers and Kings, as well as three goals and 14 points in 24 career playoff games, all with the Flyers. In fairness to Schenn, his streaky play is at least in part due to his unstable role in the lineup. He is a natural center and prefers playing up the middle, but he has been used as a winger on both sides on a frequent basis, especially considering the Flyers have a lot of organizational depth at center. It’s unclear what exactly propelled him to have such a strong second half of the season last year. Was it because he finally felt comfortable on the wing? Did he just find another gear and tap into previously-untapped potential? Or was he simply influenced by the trade of his brother, Luke, which coincided with his surge? It’s impossible to know for sure, but the Flyers are banking on Schenn entering the season with the same scoring prowess. Schenn has looked great so far this season skating on the team’s top line and top power-play unit. Including this year’s six points in seven games, Schenn now has **86 goals and 199 points in 361 career regular-season games** with the Flyers and Kings. The Flyers re-signed defensemen Radko Gudas and Brandon Manning. Gudas signed a four-year deal with an average annual value of $3.35 million, whereas Manning signed a two-year deal with a $975,000 cap hit. Gudas, 26, scored five goals and 14 points in 76 regular-season games this past season, finishing second in the NHL with 304 hits and 19th with 157 blocks. The punishing Czech defenseman had a strong second half of the season last year, even putting together an uncharacteristic scoring spree in March in which he scored five goals in ten games. Gudas has been great this season. He scored a goal against Carolina on Sunday, and he made three incredible plays to keep the puck in the zone on Saturday against Pittsburgh, which led to Claude Giroux’s first goal of the season. Manning spent the majority of last season as the team’s seventh defenseman, though he played 56 games because of injuries. Manning has been the biggest surprise and perhaps the most pleasant surprise so far this season, playing extremely well in all three zones and truly earning his roster spot. Manning scored a career-high seven points in 56 games last season but has already matched that in only ten games this year. He may not be able to keep this up, but it seems as though all of Manning’s hard work over the past several years has paid off. Until further notice, he has solidified his role in the lineup. For the most part, the Flyers stayed out of the July 1 bidding war, making only a few free-agent signings this offseason. The one substantial move the team made was signing forward Dale Weise to a four-year deal with an average annual value of $2.25 million. At first, this is a jarring contract. Though Weise adds another offensive element to the Flyers’ bottom-six, he’s not really worthy of that type of contract considering the depth at forward the Flyers have. However, it’s likely that Hextall signed Weise in hopes that he will be taken in the expansion draft at the end of the season. The Flyers also signed veteran center Boyd Gordon to an inexpensive one-year deal. Gordon will get time on the fourth line and was brought in to take important faceoffs, especially on the penalty kill. His main job is to alleviate some of Claude Giroux’s penalty-kill and faceoff duties. Additionally, the team signed Roman Lyubimov to a one-year entry-level contract, bringing him in from the KHL. Lyubimov has looked very solid so far and was recently bumped up to the third line. It’s clear his first career NHL goal is on the horizon considering how many quality scoring chances he has generated in the past few games. The only other move the team made was buying out the remaining year of R.J. Umberger’s contract. This was not a surprise, as even Umberger himself said he expected it when he gave his exit interview. The buyout cleared up $3 million of cap space this offseason. The team also re-signed forward Nick Cousins, who accepted his qualifying offer from the Flyers. Cousins was not a lock to make the team and has been in and out of the lineup so far, even with injuries to Scott Laughton and Michael Raffl. Apparently, Raffl is ready to return, so it will be interesting to see who sits in the Flyers’ Wednesday Night Rivalry game against the Red Wings. The Flyers finished last season on an impressive streak and made an emotional push to reach the playoffs. No one expected the team would make the playoffs, so on that alone, it was a satisfying season. It was a key season for the franchise as Shayne Gostisbehere figures to be an integral part of the club moving forward. It also made room for Brayden Schenn to emerge as a top offensive threat on the team. There is a lot more to come from this team, however. Prospects Ivan Provorov and Travis Konecny made the team out of training camp and will most likely stay with the team for the season (Konecny definitely will). They have both shown a lot so far this season, especially Konecny, who has played extremely well on the team’s second line with Sean Couturier and Jake Voracek. The prospect pool is still one of the best in the league, with defensemen Travis Sanheim, Sam Morin and Robert Hagg waiting in the wings. 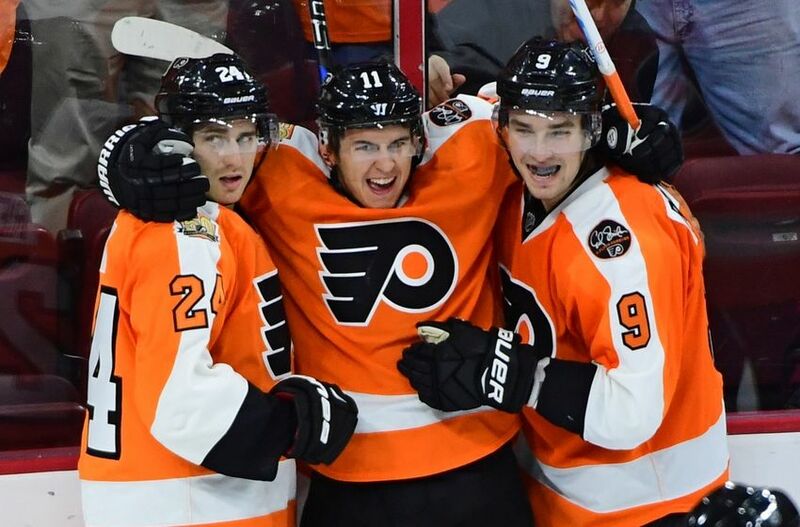 Though the team is off to a rough start this year, this Flyers team has enough talent to challenge for a playoff spot and potentially make another playoff run. Not much needs to be said here. The Pittsburgh Penguins were Stanley Cup Champions last season and will look to repeat this year. After general manager Jim Rutherford made what proved to be a key coaching change in December and acquired Carl Hagelin in mid-January, the team turned the season around and never looked back. The Penguins’ performance last year changed the game, as it has forced general managers to focus on speed more than ever. The Penguins would not have won without the stellar play of goaltender Matt Murray, however. The team played well and had an effective system and a red-hot line, but Murray was the true MVP of the playoffs, even if Crosby, who did not even lead the team in points, came away with the Conn Smythe. But things got ugly for a while last year. The team had an especially rough stretch in December and January. By mid-January, the team had lost 12 of 18 and appeared to be fading from playoff contention. Doubters said the Phil Kessel acquisition in the previous offseason was a mistake, and others even speculated that Sidney Crosby was over the hill. Mike Sullivan was still a new, unproven coach, and everything was up in the air. However, something clicked for this team as the Penguins finished the year 27-9-2. Most likely it was a combination of Sullivan, Hagelin and the youth injected into the lineup, but Pittsburgh was the best second-half team in the Eastern Conference. The line of Hagelin, Nick Bonino and Kessel, a.k.a. the “HBK” line, was dominant at the end of the regular season and throughout the playoffs. In fact, Kessel finished the postseason with more points (22) than anyone on the Penguins roster. The Penguins beat the Rangers, Capitals and Lightning before besting the Sharks in six games to win the team’s first Stanley Cup since 2009. Interestingly, this is the second time in recent years that the Penguins have won the Cup in the same year a new head coach was hired mid-season (Mike Sullivan in 2015-2016, Dan Bylsma in 2008-2009). Naturally, not many adjustments were made this offseason. There was a lot of speculation regarding the future of Marc-Andre Fleury because of Matt Murray’s play, as well as Fleury’s hefty contract and previous postseason struggles. With the expansion draft coming at the end of the year, it was unclear if the Penguins would trade Fleury, keep him until the trade deadline or keep both goalies and potentially lose Fleury in the expansion draft. However, the Penguins cannot keep both moving forward, so that will be a story to follow throughout the year. But all in all, the Penguins didn’t need to make changes aside from some maintenance work. That can happen when you win the Stanley Cup. The biggest adjustments to the Penguins’ roster were made last offseason and last year during the regular season, including acquiring Phil Kessel and Carl Hagelin and bringing in Mike Sullivan as head coach. As for this past offseason, the team made three relevant moves. The first was to re-sign defenseman Justin Schultz. Pittsburgh acquired the 25-year-old defenseman (who is now 26) from Edmonton in exchange for a 2016 3rd-round pick; the deal was completed shortly before last year’s trade deadline. Schultz spent three and a half seasons with the Oilers after signing with them as a collegiate free agent. Most of his time in Edmonton was marked by poor defensive play, plenty of turnovers and inconsistency all around. Things did not work out in Edmonton, so the trade made sense for both parties. But Schultz scored eight points in 18 regular-season games with the Pens last year and found a home on the Penguins’ roster. He played a part, however small (four points in 15 games), in helping the team win the Stanley Cup, and now he is back for another season at a much more reasonable and appropriate cap hit of $1.4 million. Schultz now plays on the team’s top power-play unit in the absence of Kris Letang and is a serviceable third-pairing defenseman. Signing him for just shy of $1.5 million was a solid deal by Rutherford to keep most of the team intact on a budget. The second move was re-signing veteran center Matt Cullen, who played a large role in the team’s success last season. The 39-year-old forward had a very strong regular season last year, scoring 16 goals and 32 points in 82 games. He centers the team’s fourth line but has been able to contribute offensively, which was a pleasant surprise for Pittsburgh. But Cullen played an even larger role in the playoff run, which isn’t necessarily reflected in his statistics. He only managed six points in 24 games but was an important player on the penalty kill, in the locker room and on the ice. Cullen has seven points in nine games so far this season. Lastly, the team decided (for now) to hold on to Marc-Andre Fleury. There was plenty of speculation regarding the Penguins’ crease all throughout the summer, especially after Matt Murray was so great in the playoffs. Then the World Cup of Hockey happened, and while playing for Team North America, Murray sustained a broken hand and has been sidelined ever since. He has returned to the lineup but has warmed the bench as Fleury continues to draw the starts for Pittsburgh. That will change at some point in the near future, but it’s unclear if Pittsburgh will risk moving Fleury at this point. 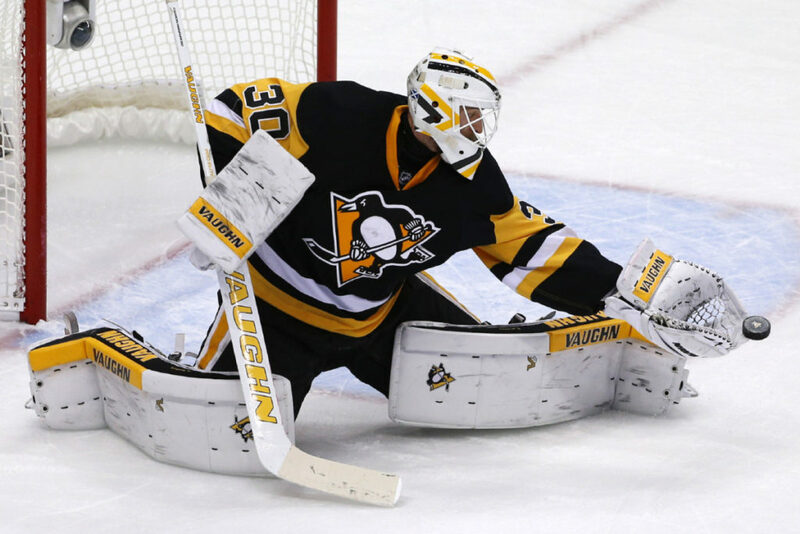 It’s likely the team realized that if Murray gets hurt again, Pittsburgh needs Fleury to pick up the slack. It wouldn’t be shocking to see the team ride out both goalies for the year to try to win another Cup before possibly losing Fleury in the expansion draft for nothing. The team also traded forward Beau Bennett to the Devils for a third-round pick. Bennett could never establish a consistent game in Pittsburgh because of frequent injuries, though he is a talented young player. The Pittsburgh Penguins came out of nowhere last year and went on a tear that resulted in a Stanley Cup parade. Pittsburgh is a team that finishes near the top of the standings every year and has therefore not had a chance to use a high draft pick in quite some time. However, now that the team has won the Cup, it’s important to note how the Pittsburgh organization was able to make strong picks in later rounds to build up a legitimate crop of prospects that played key roles in the Cup run. For one thing, the team drafted Beau Bennett with the 20th overall pick in the 2010 NHL Entry Draft. Though Bennett’s presence in the lineup has been largely inconsistent over the years because of injuries, he was still a reliable bottom-six forward for the team for years before the Pens traded him to New Jersey in the offseason. 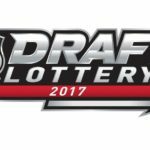 More significantly, however, the Penguins selected Bryan Rust with the 80th pick and Tom Kuhnhackl with the 110th pick in that same draft. Since the Penguins repeatedly ice one of the best veteran top-six groups in the league, late picks can have the chance to play bottom-six minutes and potentially move into a top-six role if someone suffers an injury. Clearly, Rust and Kuhnhackl played significant roles in the Penguins’ Cup run, but like the Pittsburgh team in general, both seemingly came out of nowhere last year. These players thrived in Sullivan’s up-tempo system. Plus, there’s also Conor Sheary to consider, who played many games on Crosby’s wing and chipped in 10 points in the postseason. Sheary was an undrafted college forward the Penguins picked up last summer. The thing about the Pittsburgh organization is that while the team doesn’t have much of a farm team at this point, the Penguins were able to win the Stanley Cup because players like Rust, Kuhnhackl, Sheary, etc. were given proper time to develop. So often in this league player development is rushed. Sometimes it doesn’t make too much of a noticeable difference, but sometimes a player with tremendous promise fizzles out. It’s not always because the player was rushed, but teams that build through the draft and develop have been shown to win. The Penguins are not in the same league as the Chicago Blackhawks or Los Angeles Kings, but you can’t deny that these three players, for example, played a huge role last year. It’s incredibly difficult and unlikely for a modern-day team to repeat. However, that is Pittsburgh’s goal this year, and the team is in good shape to try. The goaltending is still somewhat up in the air, but there are no concerns for this team at this point. Again, that can happen when you win the Stanley Cup. Last year felt like it was the Washington Capitals’ year. The team was dominant from game one through game 82, easily winning the President’s Trophy without having to exert tremendous effort. In fact, the Capitals could have had a much better season if the team gave 100 percent night in and night out. Even some of the players admitted in the offseason that a lot of the time the team knew it wasn’t playing its best but was confident things would pick up once the playoffs started. Unfortunately for the Capitals, that did not happen. That’s not to say that the Capitals didn’t have an incredible season. Braden Holtby tied Martin Brodeur’s record for most wins in a season with 48, and he did it in 12 fewer games. Alex Ovechkin once again hit the 50-goal mark, and he even joined the 500-goal club along the way. Evgeny Kuznetsov had a breakout season with 77 points, leading all Capitals and finishing ninth in league scoring. Newcomers T.J. Oshie and Justin Williams both scored 50+ points, and the team was able to win consistently regardless of how many starters were out of the lineup. The regular season was almost like a long warm-up for the postseason. The only problem is that the Capitals never fully woke up. Washington drew a tough first-round match-up against the Flyers. The Flyers were clearly a much inferior team, but goaltender Michal Neuvirth played incredible hockey, and Philadelphia was inspired to win for their late owner Ed Snider, who passed away shortly before the team officially made the playoffs. Even though the Capitals took care of things in six games, Holtby had to be at his best (he was), and it was a hard-hitting and hard-fought series, which is never helpful when you’re trying to make a deep playoff run. For round two, the Capitals drew the Pittsburgh Penguins, who beat them in overtime of Game 6. Holtby was awful for most of the series (it was later reported that he was hurt), and many of the players failed to step up in important situations. Ovechkin was great throughout the playoffs and gave everything he possibly had in every game. He cannot be blamed for the outcome, though many did anyway. After what felt like the year of the Capitals, Washington went home on a shocking overtime tally and spent the past several months in a disappointed stupor. Of course, every team must rally for a new season, but it will take the Capitals some time to gear up for this one. The team has been largely inconsistent so far, with the top two lines failing to generate much offense or consistency and Holtby playing mediocre hockey. Coach Barry Trotz recently shuffled all four lines, and the team has plenty of time to figure things out. After last year, Washington knows the President’s Trophy is meaningless. All that matters is the playoffs and reaching the third round, something this team has not done in the Ovechkin era. With most of the team still intact, the Caps made very few offseason changes. However, there are a few new faces in the lineup. The Capitals made a trade at the draft that sent two second-round picks to Montreal in exchange for forward Lars Eller. Eller was never able to establish a consistent role on the Canadiens but has always been a smart two-way player. The Capitals most likely felt they needed more depth up the middle after facing Pittsburgh’s four strong centers in Sidney Crosby, Evgeni Malkin, Nick Bonino and Matt Cullen. Jay Beagle is a great all-around player for Washington, but he is best suited on the fourth line. Eller could be a great fit in a new environment and with a clearly-defined third-line role. So far Eller has played well this season. He only has one goal in eight games, but his hockey sense and strong two-way play have been evident all year. This was a smart decision for Washington, especially since center/winger Marcus Johansson has shown he is talented enough to be a top-six forward. Johansson was also a restricted free agent this summer, so Eller could have been some insurance if the team was unable to re-sign MoJo. The team re-signed several of its starters, including Tom Wilson, Marcus Johansson and Dmitry Orlov. Wilson signed a two-year, $4 million extension. This seemed like a lot at the time of the signing, though the Capitals have faith in Wilson that he can become the offensive threat he was in the OHL. Wilson has not shown much promise so far this season, but he had some strong stretches on the team’s third line with Johansson and Jason Chimera last season and does have the skillset to contribute more offensively. The Johansson signing took a little longer and was a little more nerve-wracking for fans. However, the team eventually reached an agreement and re-signed the Swedish forward to a three-year deal with an average annual value of $4.583 million. This deal shows Johansson that the team believes in his ability and his significance to the team. It’s on the high end of the spectrum, but the team had to get a deal done. MoJo had another strong season last year and was rewarded with the hefty bridge deal. He leads the team in points so far this season with five goals and nine points through eight games. The last of the free agents was restricted free-agent defenseman Dmitry Orlov, who signed a one-year, $2.57 million contract. The deal took a long time to get done and was finally reached after the World Cup of Hockey. This is a lot of money for Orlov, but it’s something both sides were able to agree on. Orlov is set to play a larger role on the team this year. He started off the year as John Carlson’s partner and has been more aggressive offensively by shooting more instead of looking to pass. Orlov is expected to become an important member of the team’s top-four. The Capitals made very few free-agent signings but did pick up forward Brett Connolly on a cheap one-year deal. Connolly is a former first-round pick but has never fully lived up to expectations. He started out on the Lightning but never had a consistent top-six offensive role. He spent all of last season on the Bruins, where he mostly skated on the fourth line but picked up 25 points in 71 games. Connolly does have the potential to be a strong bottom-six winger, especially since the Caps want to add more offensive punch to the team’s third line and especially its fourth line. Connolly scored his first goal as a Cap Sunday night in Calgary. The only other move of the offseason was the signing of Zachary Sanford to a three-year entry-level contract. Coach Barry Trotz spoke very highly of Sanford before the season started, saying he believed he could see Sanford in a second-line role. Sanford has primarily been on the third line this season but has only played in six games. The Capitals had a very strong season last year. The team was hot from the beginning, and the President’s Trophy was almost a foregone conclusion by February. However, the Capitals did struggle at the end of the year, losing six of the team’s final eight games headed into the playoffs. Not only did this force Holtby to play when he could have rested, but it prevented him from beating Brodeur’s record, something he should have been able to do pretty easily. Unfortunately, the Capitals never fully established their dominance in the playoffs. Sure, they took care of the Flyers and were clearly the better team. The series only stretched to six games because of the play of former Caps goalie Michal Neuvirth. But the team never fully put it together, and it showed in the second-round series loss to the Penguins. The only real lineup loss in the offseason was Jason Chimera, who had a very strong season last year with 20 goals and 40 points; however, it was time for the Capitals to move ahead with young blood in the organization. But the Capitals learned last year that the regular season only means so much. Obviously, it’s crucial to win enough games to make the playoffs, and home-ice advantage is nice. But the Capitals are playing for the postseason. The team needs to work on the system and develop into a stronger team overall so that when April rolls around, this team is more prepared than it was last year. There’s not much to be said about the Caps. The Capitals are expected to make the playoffs despite the tough competition in the Metropolitan Division. But the regular season is just filler as the players gear up for another Cup run. This team is desperate to reach at least the third round, but at this point in time, anything short of a Cup win will be a failure for a team so talented and capable.